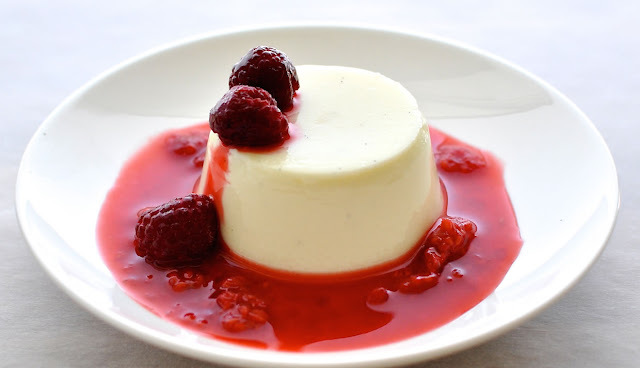 How to Make Panna Cotta with Simple Method- Hello everybody, welcome back with ZetiraKitchen! Today I will share about How to Make Panna Cotta with Simple Method. Panna Cotta is dessert from a Southern Italy area. Made by Hungarian woman in the 19th century. She's made Panna Cotta from ingredients egg, coffee, and, vanilla. Why did it call panna cotta? Because in Italian, Panna meaning cream and Cotta meaning cook. Everyone loved Panna Cotta. The sweet taste and soft texture make it mostly yummy if served while cold. So, let's start trying to make yummy Panna Cotta! Pour gelatin and milk into a bowl. Then mix it. Prepare a pan then put in sugar and liquid whipped cream. Heat the sugar and liquid whipped cream with medium heat. After warm, add the gelatin mixture and fresh milk. Stir until boiling and put in the vanilla. Pour the mixture in some glass. Cool it in the refrigerator until cooled. Give topping of whipped cream and give some strawberry sauce, then served it.